Super sized bow for those super sized bow and Patriotic lovers! This is a true American Bow! The bottom layer is a 4" grosgrain ribbon that is lined with a white 1.5" grosgrain ribbon. The top ribbon is the three striped red, white and blue true American ribbon! The center is wrapped with a 7./8 inch blue grosgrain and it is attached to a large sized French clip. 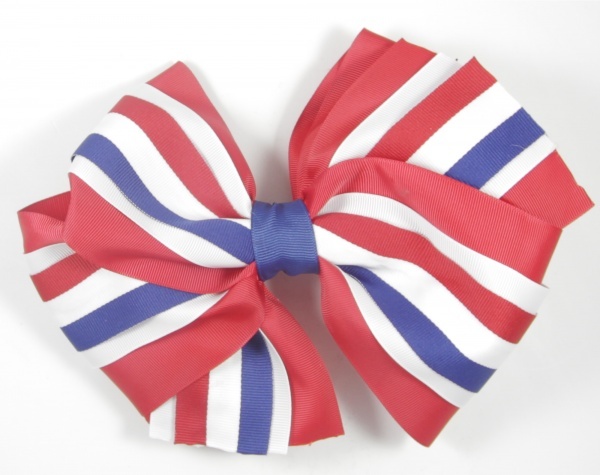 Your little one can proudly display her love for this country with this super sized bow.